The Mercedes-Benk GLK offers an optional child seat recognition system from Luxembourg-based supplier IEE SA. The system automatically deactivates the front-passenger airbag if it detects a child seat. That is just one of the car's safety features. U.S. supplier Johnson Controls Inc.'s instrument panel was specifically designed to improve airbag deployment in the GLK. The structure, which has a surface made from thermoplastic polyolefin, is laser weakened in specific areas to enable the airbags to break through in a controlled, predictable manner if there is a crash. JCI also supplies the car's headliner (including the sun visors and grab handles) and the structure of the rear seat backrest. 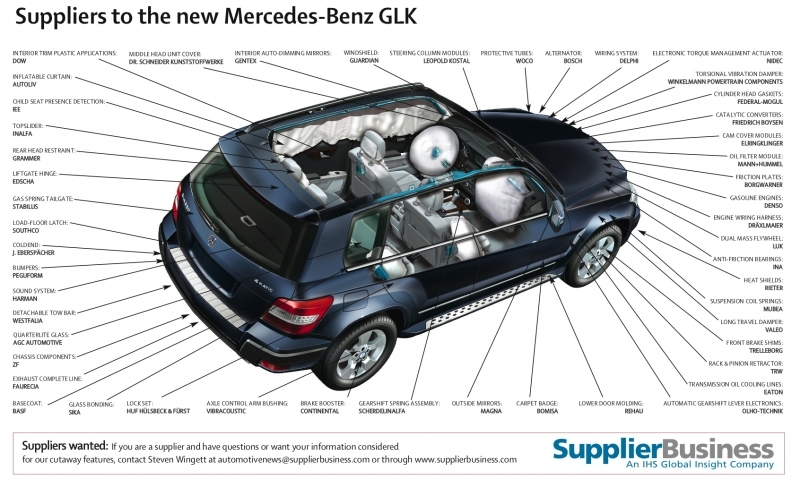 Autoliv Inc. of Sweden supplies the SUV's inflatable curtain airbag, along with seat belts, which are equipped with pretensioners that reduce slack if a collision is predicted. Mercedes produces the GLK at its plant in Bremen, Germany. Prices in Germany start at 36,295 euros.